Every week in the PGA, the pros compete on Thursday and Friday for a chance to play for money during the weekend. The cut is typically established as the top 70 players. Sometimes a 10 stroke rule is applied and the tournament will take the top 70 players plus anyone else within 10 strokes of the leader. That seems easy compared to making my son's high school team. My son, a freshman, competed for a spot on his high school team the first week of August. He was trying to make the JV team. The HS has two teams, JV and varsity. Each team has 12 golfers. The golf team has 24 total players for a school that enrolls 800 students. Needless to say it was very competitive. At the golf informational meeting prior to tryouts, the golfers were told that if they shot an 85, they would likely make the cut. As soon as baseball ended in late July, my son, Nic, started practicing golf. He played at least 27 holes per day for 15 days. When the tryouts came around he was fairly confident that he could shoot 85. He was ready. I, on the other hand, was not mentally prepared for it. It would be one of the first pivotal youth sports events that I would not be able to watch. I would not be there to give him a supportive look. I would not be there to cheer him on or encourage him to keep his head up. He was on his own and I felt a deep void during the hours he was on the course. The tryout consisted of three 18 hole rounds - Monday, Tuesday and Wednesday. The tryouts started August 6th at noon. My wife drove my son to the course. I think that she was more nervous than my son was. She watched him hook his first shot into the woods and walk off down a hill and out of sight. She would call me 5 hours later from a position high above the par 5 18th green. She gave me the play by play as he approached and tried to read his demeanor. "He hit a drive down the middle. It was a good drive, but he is walking to the ball with his head down low. Oh this does not look good. He hit his drive the furthest, so he will have to wait. He just hit his second shot. He is in the fairway in good position. I can't tell his demeanor. OK he is approaching his ball.... He's hitting... the ball is high in the air... it looks good...oh no, it's short of the green and rolling down a big hill. Ugh. Wait! He's walking up with a big smile. Oh, maybe he is doing ok. It is his turn again. He hit it up, it's on the green. stop, stop, stop... it just rolled off the green. He is in the rough behind the green. He is sitting 4. He will need to chip in for a par. He chipped on. He has a 15 foot putt. Long putt. It looks good. It stopped right next to the hole. He just tapped it in for a 7. He is smiling. Is that a smile of relief. Or do you think he did ok?" Despite the 7 on the 18th, my son shot an 86. He was made the cut established at 100 for the first day. On day two he had an 8am tee time. I drove Nic to the driving range at our club at 6:30 am. It was still relatively dark. The range was not open yet, but the night before, Nic hid about 40 range balls in some tall grass so that he could warm up prior to the tryout. The second day was more of the same. He shot an 85. I felt the void again until he called me with his score. I was so proud. The cut for day two was set at 90. He made the cut again and was thrilled. One more day and all he needed to do was shoot an 84 to secure his goal of getting an 85 average over the tryout. As he approached the 18th green, my wife called me to give me the play by play. He played the hole well. My wife described his big trademark smile as he tapped in a putt for par. He shot an 83. He was the first group off, so he had to wait and wait for the official results. Once everyone was done, the coaches called the players over. The coach gave out 8 spots. 4 freshman and 4 sophomores and he cut 6 players. My son was not on either list. The coach then explained that 2 freshman and 2 sophomores are on the bubble. That meant the he had to wait until the varsity team established their team before he could lock up the final spots. He explained if the varsity team dropped down 4 players, the 4 bubble guys would be cut. If 3 players dropped down, then the 4 players would compete in a 9 hole shootout on Friday for the final spot. And so on. The varsity did drop down 3 players, so my son had to compete for the final spot. He was deflated because all of the scores from the previous 3 days carried forward. He had the 2nd best score of the 4 remaining bubble players, but he was 9 strokes behind one of the sophomores. He arrived on Friday with nothing to lose. He had played conservatively on the tight course all week. He rarely hit his driver, which he can hit 300+ yards, thinking he could make 85 without it. On the final Friday, he pulled out the big stick and went for it. He played some holes well, but got into trouble on others and could not make up the ground. He was cut and he was devastated. While Nic was playing baseball all spring and early summer, the kids who made the team had been playing golf. It is just too difficult to make a competitive team in a big school when you are not dedicated to the sport. Nic has decided that he is going to give up on baseball and concentrate on golf. He is a good baseball player, but he probably has a better chance of succeeding at golf. The perennial state-championship baseball team at his school is ultra competitive too. Well, the good thing about golf is that the score determines who makes the team, not politics. I am proud of my son. He handed the pressure very well. He set a goal and met it, unfortunately it was not quite good enough this year. Next year will be different. The ball needs to get through seven other players (8v8 game) before it gets to me. I'm not alone. rips a low hard shot destined for the back of the net. CC reacts like a cat and deflects the ball wide of the post. She come up big again in this close contest. were lost in the final minute. Goalies need to be tough physically and mentally. Youth Sports: Dad, I don't want to play in college. I started Stats Dad to chronicle my kids youth sports adventures, the ups and the downs, the wins and the loses, the tears and the fears, the hard work and fun, the cheers and the jeers, and the joys and the frustrations. My family has experienced the full spectrum many times over. Well, my family is not unique. There are many families doing what we do, feeling what we feel, etc. So it is time to open up the platform for others to share their stories. I have invited Mike Ewing, a dad, an ex-collage baseball player, a baseball coach and the creator Baseballinstructionalvideos.net to share his sports dad story on StatsDad. I am glad that I did, because Mike's daughter, Ansley, taught me something that I needed to know as my pre-teen girl athlete advances is sports. Enjoy. Ever since I was young, sports have been a large part of my life. My athletic career got off the ground when I was 8 in Little League. I was horrible that first year, but we won first place and I was hooked. I ended up improving enough at baseball to earn a college scholarship and I even played for a few years after college. I was forced to hang up the spikes due to injury but at that time, my children, Ansley and Conner, were starting their careers. This filled the void. Ansley, is my oldest, started out in gymnastics at 3. Soccer came along at 4 and softball at age 5. She gave up on gymnastics and softball after 2 years. She started playing basketball at 9 and that lasted a couple of years. She eventually discovered volleyball at age 12. Conner started soccer and baseball at 4. He excelled at both and couldn’t get enough. He played baseball and soccer in the spring, summer, and fall, and basketball in the winter. Football eventually entered the mix when he got older. Football became an on-again off-again love affair, but baseball always consumed him. He played year round on as many as four teams in a season. By the time Ansley reached high school, she had become a very good volleyball player. She played club volleyball in the spring and high school volleyball in the fall. She traveled all over the southeast and midwest. She excelled and started getting noticed by some college coaches. We were excited since she was playing a tall girls sport at only 5’ 1”. Ansley got her first offers during her junior year from smaller DII and DIII schools. Of course she dreamed of a big DI school, but at 5’1” even as a libero, the chances were remote. The possibility of being a dad of a college athlete made me think about my parents when I played college baseball. I remember how proud they seemed to be. I couldn’t wait to feel that same sense of pride with my kids. I would have to put off that feeling for a while because I was hit with this BOMB. At the beginning of her senior year of high school, Ansley decided she did not want to play in college. At first I couldn’t understand how anyone would not want to be a college athlete. I would not have been able to attend college at all if I had not had a baseball scholarship. She had decided that she just wanted to be a student. She had missed out on a lot in high school. She had missed the prom her freshman, sophomore, and junior years because of volleyball tournaments. She had tournaments the day of the homecoming dances as well. She was able to attend those, but didn’t have time for dinner, pictures, etc. Luckily, we can afford to send her to school. I grew to support her choice. College is more than just going to class and studying. There is a lot to learn and do outside of the classroom. I hope she gets to do some things I didn’t have time to do in college. Life is a bit less complicated for us now. Conner is just now starting his sophomore year of high school. The hard part is going to be figuring out what to do with all of our free time. After years of driving in separate directions, my wife and I might actually have a free weekend or two with no ballgames or practices and we will have to learn how to watch games together. In three more years we may really be bored. Over all of the seasons, my wife and I put thousands of miles on our vehicles and spent who knows how much money. We wouldn’t trade it for the world. We have great kids and great students (the number one priority for our kids), who excel at athletics. We couldn’t have been prouder of our kids. Mike opened my eyes. He reminded me that short girls can excel at tall girl sports. My girl, CC, is 40th percentile for height and 12th percentile in weight for her age, but she plays at the 99th percentile of heart and hustle. I assume his daughter, Ansley, was the same way. More importantly, Ansley also taught me that there is so much more to life for young athletic girls than sports. My daughter misses sleepovers and parties to go to soccer and basketball tournaments all the time. As youth sport parents, we might think that these things are trivial compared to the next big game. Maybe, just maybe they are not so trivial. Sports burn out is a reality. In the last post, I suggested that parents should limit their role in youth sports to sperm and egg donors, check writers, schedulers and bus drivers. My rant was about the parent-led drama-filled story about my daughter's AAU spring / summer basketball season. Thanks to another group of parents, my son's spring / summer baseball team was a debacle too. Don't get me wrong, the action on the field was great. The boys all liked each other and played hard. They struggled to get wins early in the season, but came on very strong at the end of the season and won the Nations Baseball World Series in Pensacola, Florida. The parents are the ones who made the season quite miserable. Parent coaches sparked discontent among many of the other parents. 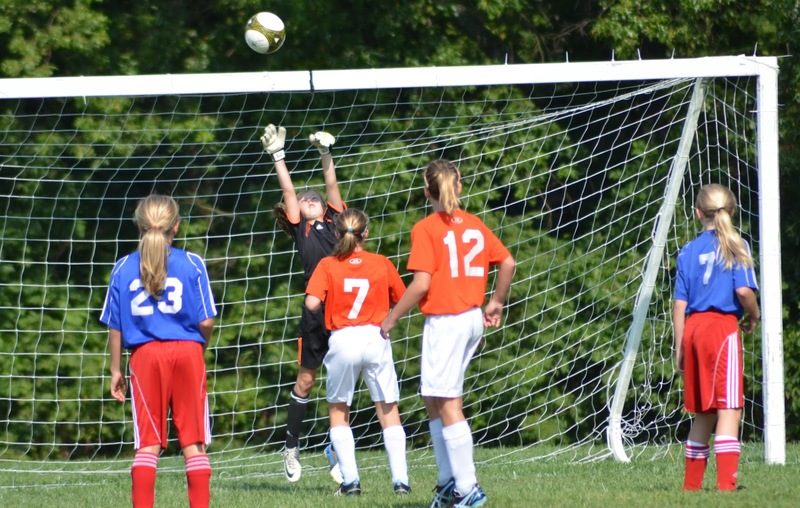 Youth sports parents with competing interests and goals often leads to no good. The team was originally billed as a professionally coached team. They had a hitting coach, a pitching coach, an ex-minor league catcher to coach catching and all baseball fundamentals. The two parent coaches on the staff both had roles one the team too. They were tasked with the administration work and management of the games and practices when the professional coaches were not around. One of the reasons my son picked the team was because he made an instant connection with the hitting coach at tryouts. Sadly, my son never saw that hitting coach again after the tryouts due to personal reasons and conflicts. The pitching coach, a former minor league player and son of one of the dad coaches, was / is terrific. He could teach and had a great rapport with the kids. The only issue with him was that he was not a regular sideline coach. He was primarily available in the winter, but not very much during the regular season. This was not an issue for my son because he does not pitch, but the other very talented pitchers on the team could have benefited from more pitching instruction. The "ex-minor league catcher" coach was terrific coach too. He's a young, energetic and credible. The kids loved him. The problem, he coached high school baseball and was not available until the later half of the first season. And by the second season, he was not available at all due to a work / grad school conflict. That left two dad coaches. Another dad, also joined the staff to help out. So essentially, we had an elite team with three parent coaches. This is not unheard of, most of the teams had dad coaches too, but it did not seem to work in this case. Many of the parents did not like how their kids were being played (positions, batting order, playing time, etc.) vis-a-vis the coaches kids, actually one of the kids in particular. The anger and resentment boiled up and up as the season went on. The bickering and complaining got louder and louder as the season went on. The calls to the coaches to complain became more and more frequent. I buried my head in the stats book and tried to steer clear of it as best I could, but it was pervasive among the dads and the moms. I have learned over the years that complaining does not work. It actually makes you feel worse about the situation and yourself. In Pensacola, Florida, the the last pitch was thrown and the kids collected their championship trophies. Five minutes later, all of the families jumped in their cars for an 11 hour drive, and the majority of the team would never play together again. It didn't matter that the kids really enjoyed playing together. If your son plays baseball at a high level, get him on a team with a professionally paid coach who calls the shots, makes the line up and assigns positions based on merit. And have your son work hard to earn his spot. And finally, during the season don't complain and make the season miserable for everyone else. Trust me at the end of the day, talent will eventually win out. It always does. The parents on this team were fun to be around when baseball was not the topic. I will actually miss hanging out with them. I have learned that many parents make a lot of emotionally based mistakes with their first young athletes. I was one of these complaining parents with my first kid and a little with my second kid earlier in his career. Overtime, I figured out that complaining was counter-productive and stressful. The parents from this baseball team will figure it out too. I wish them and their kids well. Youth sports would be so much better if parents limited their role to sperm and egg donors, sports financiers, secretaries, and taxi drivers. They can be fans, but they need to stand far away from coaches, umpires, refs, league volunteers, etc. A few of the parents for the teams my kids played on this spring ruined the year with their complaining, bickering, scheming and undermining behavior. Last year, my daughter's AAU basketball team was #1 in Ohio and finished #9 in the nation, but this year was filled with controversy from the beginning. Prior to this season, one of the team's best players left the team. She left to find a better technical and tactical coach, one that matched her skills and style. This made sense to me because the girl is a special talent. I was sad to see the girl go, but I understood the situation. My family wished her and her family well. I cannot wait to watch her play in college in 8 years. With the departure of this key player, our team was not as dominate as it once was. Regardless, the team was still very strong. They won a 6th grade league as 5th graders and qualified for AAU Nationals Division I. The girl who left joined a new team, a team that became the dominate force in the state. The new team beat our team by 17 and went on to finish 5th in the country. A few of the parents on our team could not handle being knocked down. As a result, they gave the coach a hard time. They called team meetings. They cajoled other parents on the team to join their fight. The next thing I know, I was in a meeting voting on a suggestion to skip the AAU Nationals. The group did not want their kids to be embarrassed at Nationals. To me avoiding failure is just as damaging to a young girl's psyche as failing. What does avoiding failure teach a kid? Were the parents worried about the fragile egos of their kids or their own egos? I voted to go because 11 year old girls who compete in any tournament - win or lose - remember running in the halls of the hotel, racing up and down elevators, jumping on beds, swimming in the hotel pool and laughing with good buddies as much as the basketball. I was in the minority. We did not go to Nationals. Despite my displeasure at the situation, I was not overly vocal. 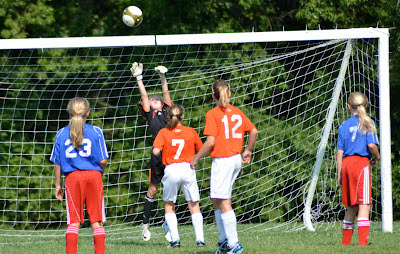 My daughter played both AAU Basketball and travel soccer. 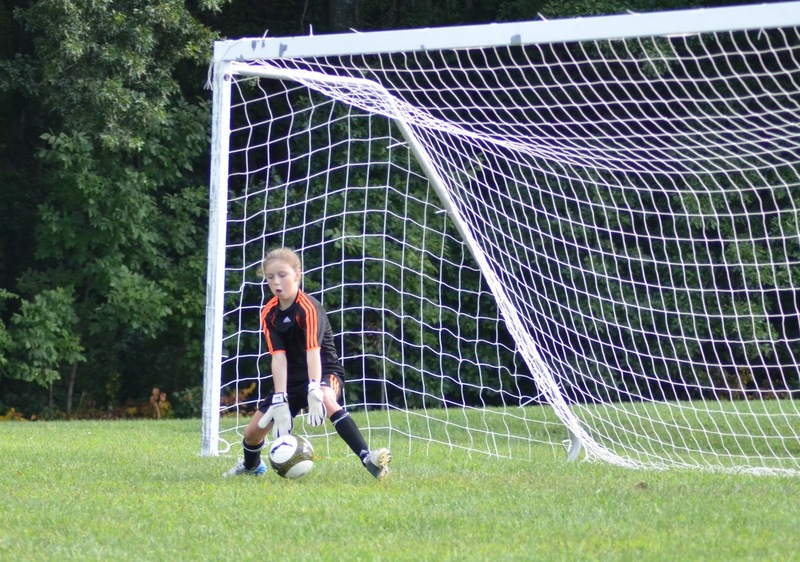 She had to put soccer ahead of basketball because she was the starting goalie on her travel soccer team. As a result, she missed quite a few basketball games. My daughter was not a starter on the basketball team. One of the parents, called my daughter out for her lack of commitment in one of the meetings I missed. We made a decision to play multiple sports because our daughter is too young to specialize so I accept the criticism but if we had to do it all again, we would do the same. I am not sure if it is connected to the situation, but my daughter has decided to give up AAU basketball and concentrate on travel soccer and school volleyball and basketball. Last year, she was thinking about giving up soccer to concentrate on basketball. Funny how things can change so quickly. Parents, if you do not like a team situation don't be a cancer. 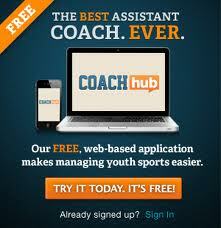 Simply leave the team at the end of the season and find a better situation for your kid. One of my readers asked this question about the US vs Canada Women's Olympic soccer game. "Just wondering if you would write a post on the debatable calls made by the ref in the Canada v US semi final? Being a ref myself I obviously don't want to hear her [the ref] bashed, but being a Canadian it was obviously very hard to watch. If you purposely avoided this iffy topic sorry, but I would appreciate your thoughts." My daughter played her season opening tournament this past weekend. The first game was an 8-0 blowout. 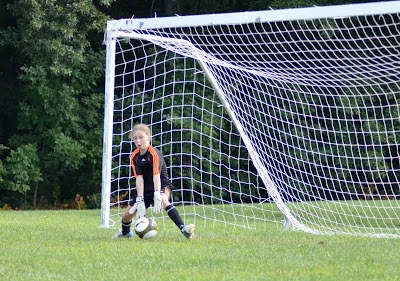 My daughter, the team's goalie, touched the ball once the entire game. The second game was a 4-0 win. Again, my daughter was not challenged. The third game was a different story. Every ball in this game was contested and both goalies were tested. The girls from both teams were working hard because the winner would advance to the championship bracket and the loser would go home. 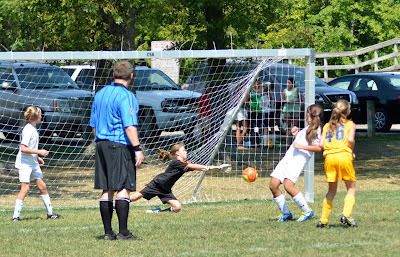 My daughter made save after save including a save off a direct kick right outside the box. The questionable penalty was called at the top of the box on a 50/50 ball. 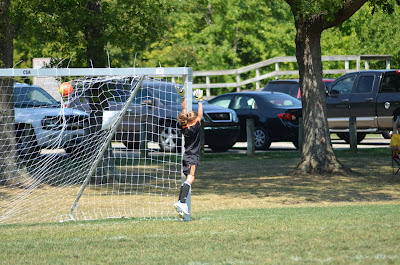 Luckily, my daughter was able to knock the ball over the cross bar. Late in the second half with our team winning 1-0, the opposing center midfielder ripped a low hard shot from outside the box. 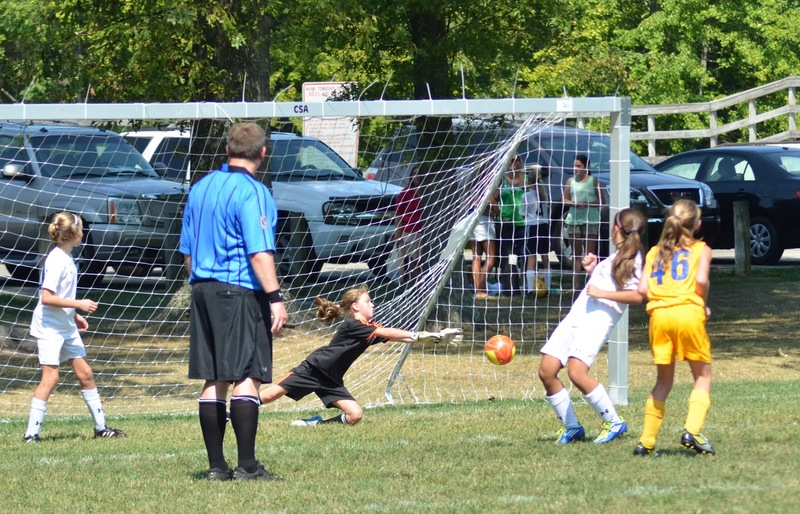 One of our defenders put her hands up to defend herself and knocked the ball down. The defenders hand was extended, but the ref did not make the handball call. I whispered to the head coach, "If our defender were Canadian, the ref would have blown the whistle." The coach gave me a knowing smile. I watched every US women's soccer game with great interest and national pride until the ref called the Canadian goalie for holding the ball too long. It is a penalty that is rarely called. At the time, I thought it was a ridiculous call, especially at that point in the game because the call determined the outcome. (The resulting indirect penalty kick led to the somewhat questionable hand ball call in the box. That handball penalty led to the game tying PK goal by Abby Wambach.) The Canadian women would have won that game and advanced to the gold medal game against Japan, if the ref had kept her whistle silent. I hate when a ref's call determines the outcome of a game, but many non-calls determine outcomes too. The bottomline is that refs need to enforce the rules to protect the players and the integrity of the game. The ref in the US vs Canada semi-final London 2012 Olympic games made a call at the end of the game that was technically correct, but rarely enforced. The rule in question governs how long a goalie can hold the ball. According to the official rules, goalies can hold the ball up to 6 seconds before they need distribute it. Many goalies, including Hope Solo, hold the ball for way longer than 6 seconds. The Canadian goalie held the ball over 16 seconds several times before in the game and according to reports had been warned by the sideline ref and the head ref. She foolishly risked a penalty to shave off a few precious seconds. What the goalie did not know was that Abby Wambach was in the refs ear. 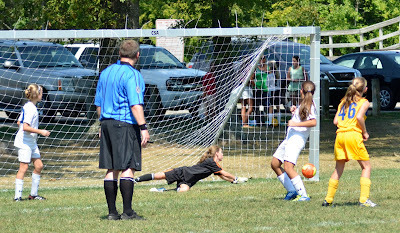 Everytime the goalie made a save late in the game, she would go close to the ref and count out - 1 - 2 - 3 - 4 - 5 - 6 - 7 - 8 - 9 - 10 - etc. seconds to highlight how long the goalie held the ball. Amy Wambach was smart. She knew the ref could not blantanlty ignore the infraction because it's a rule for a reason. Good soccer players play with their head. Abby Wambach uses her head to score goals better than anyone I have ever seen play the game. What I didn't know about Abby Wambach is that she uses her brains too. The Canadian goalie did not use hers and cost her team a chance for a gold medal. Although I thoroughly enjoyed watching the US Women get World Cup revenge over the team from Japan, the calls against Canada, although technically correct, tarnished the gold medals of the US women for me. If the 6 second rule is going to be enforced it should be enforced all the time not arbitrarily. In basketball a player has 10 seconds to get the ball across the half court line. This rule is in place so a player cannot delay the game in the back court. When a player has the ball in the back court, the ref moves his / her hand back and forth to count seconds. Once the ref gets to 10 seconds the ball is turned over to the other team. Soccer should adopt this same approach. The ref should use a visual clue and call it at 6 seconds every time the goalie holds the ball too long. And I think that the other team should get the ball on a throw in instead of a indirect kick from outside the 18. That would keep the game moving and fair. Finally, a good lesson for young players - Know the rules and use them to your advantage. 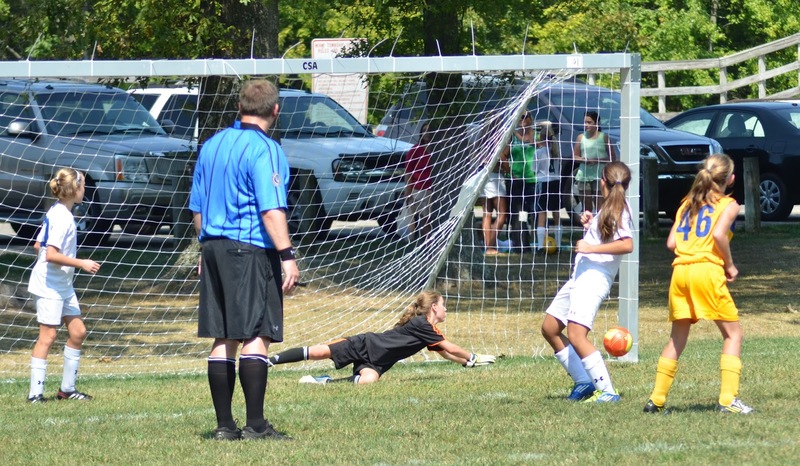 Side Note: Many youth soccer teams are instructed to kick the ball as far out of bounds as possible when the team is winning the game and time is running out. There are no ball boys / girls so lots of time is consumed when this happens. Every night over the last couple of weeks, my family and I watched the 2012 London Olympics. Although NBC did an absolutely terrible job covering the games as a whole, we enjoyed the action and the inspiring athletes. I have always loved the Olympics. It's amazing how the Olympics make sports that are meaningless to the masses, so incredibly meaningful for 2 weeks every four years. What I liked most about the London Olympics was how they inspired my kids. My daughter is not a gymnast, but she was inspired to do hand stands and cartwheels after watching the USA women's gymnastic team and she could not wait for the soccer season to start after watching Hope Solo make some amazing saves. My son is not a volleyball player, but the Olympics has him thinking about playing volleyball. The Olympics inspire kids. NBC featured a story about Fabiana Murer, a Brazilian athlete. She wanted to be a gymnast, but she grew too tall, so after watching the 1996 Olympics in Atlanta, she got into pole vaulting. NBC also featured stories of young Kenyans who run in the footsteps of their national Olympic heros. There were countless references of past Olympic athletes inspiring this generation of athletes. AT&T did a great series of ads that tapped into this insight. The ads, created by BBDO NY, the world's most awarded agency in the world, integrated inspiring footage from the London Olympics into the ads what seemed to be instantaneously. Seemingly 2 minutes after Rebecca Soni became the first women ever to break the 2:20 mark in the 200M breast stroke, her world record breaking race and time were featured in an AT&T Rethink Possible ad. A young aspiring swimmer in the ad, actually wrote Rebecca's winning time on a dry erase board. I was floored at first, forgetting that the race actually happened 9 hours before the ad was played on national prime time TV. Still, I'm in advertising, so I know that a 9 hour turnaround time is amazing. What made the ads even more impressive was the realism. BBDO did not add some fake looking computer graphic overlay to show the record time. How did BBDO and AT&T do the Olympic Rethink Possible ads? BBDO filmed the ad with the actor writing many possible times in a predicted range then edited in the matching time. Almost anything is possible if you set your young athletes set their minds to it. Have them watch inspiring athletes and write down goals. Your kids can not strive for goals unless they have some. NBC is promoting the 2012 London Olympics as the first social games. Funny I thought they said that about games played in China. Regardless, many of the athletes are tweeting about their experiences. That’s really cool. A fan can really feel like they are getting direct access to the stars they admire because, well, they are. The Olympic athletes need to understand that what they say on Twitter is there for all to see. Their Tweets, like it or not, define who they are or the perceptions of who they are. Their followers and the blood-thirsty media are evaluating their words and forming opinions. This advice is not just for Olympic athletes, it goes for high school and college athletes too. Some coaches, teachers and recruiters monitor social media so a student-athlete has to be a bit guarded with their social media behavior. 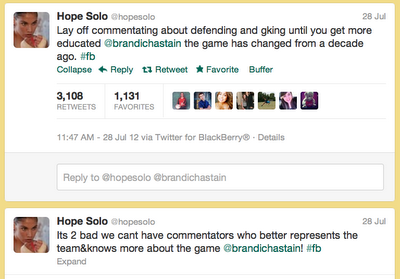 Hope Solo, hurt her brand with her criticism of Brandi Chastain. Hope Solo had nothing to gain with her twitter rant and a lot to lose. She could lose sponsorship opportunities or future TV job opportunities. She was upset that Chastain was unfairly critical of a US defender. 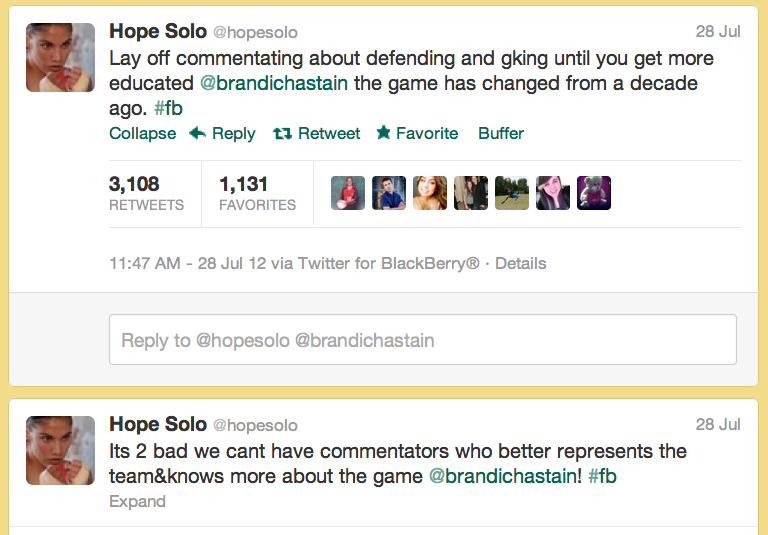 She thought Brandi should be promoting the game and the US team instead of criticizing them. Chastain is not on the US team anymore. She is not paid to represent the team, she is paid to analyze the game. Ironically, Solo’s off-putting comments do nothing to promote the US team or the game. Her short-sighted comments were suppose to be supportive of her teammate, but ended up putting her teammate in the spotlight. Here are 15 random Twitter Rules for Student - Athletes. Please add to this list in my comments section. 1) Build your reputation (or your brand) with informative, interesting insightful or funny tweets. Don’t erode your brand with negative, hate mongering, rants. If you do not like what the media, or a fan, or a coach says about you, don’t get into a Twitter war. You will win by ignoring it. 2) Be real on Twitter and show your personality. You will not get a following if you don’t, but you need to be a bit guarded for good reason. 3) Read each Tweet before you hit send. Take pride in yourself and / or the institution or team that you represent. Ask yourself if the tweet represents who you are or want to be when the tweet is viewed by the world (Fans, current coaches, current teachers, parents, future coaches, future colleges, future employers, friends, family, etc) If the answer is no, delete it. By the way, the NCAA and individual schools monitor social media. Don’t risk your scholarship by Tweeting information that might contain clues to a rules infraction. 5) Don’t put others down. You will come across as insecure. Keep your Tweets real, but lean more toward the positive side of life. 6) Don’t consistently complain about your demanding sports and school schedule. If you are a top HS athlete or a collegiate athlete on scholarship, you are in the top 1 to 5% of people. Meaning 95% of people do not want to hear about your demanding schedule 24/7. 7) Engage with your fans from time to time. Followers love the acknowledgement. 8) Don’t Tweet or ReTweet profanity – makes you look small.